The deep contour body on the Ovation Standard Elite 2778 AX along with its AA solid spruce top produce a lot of tone and projection thanks to carefully designed scalloped X bracing. Its deluxe hardwood-adorned sound holes add a warm and natural touch to the guitar's cosmetics while helping generate plenty of focused output across the entire tonal range. The Ovation OCP-1K pickup creates the powerfully convincing sound that has made Ovation the name most closely associated with the acoustic-electric guitar. Sounds great on your lap or on the stage. Order today! This purchase of an Ovation 2778 AX is an upgrade from a Celebrity Elite. The 2778's deep contour bowl adds richness and depth to the overall sound without compromising clarity and articulation. The DC bowl is also more ergonomically designed for comfort and to reduce slippage off your leg. Unplugged, it has a very balanced low-mid-high tone, but without a harsh high end. Just very smooth. The OP-Pro preamp is quite responsive and the pre-eq switch can really change the sound dramatically. The neck seems a tad thicker than the celebrity guitars and not quite as much of a pronounced soft V shape. A little more C shaped. Action is low and uniform and as easy to play at the 15th fret as it is the first fret. The inlaid epulets add beauty to the guitar. Just an overall great instrument for the price. 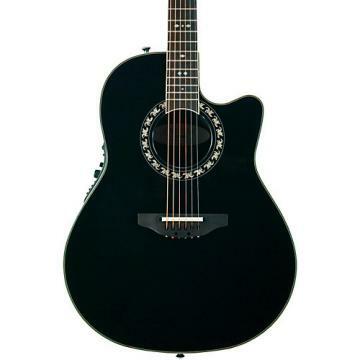 .It would be difficult to find a better acoustic-electric in this price range. Acoustically you won't get the volume out of it that you would with a typical dreadnought, but is loud enough and the tone is still great. The action is decent so long as you remove the shim that is placed underneath the bridge. The EQ system provides a wide range of tonal options and tuner has proved to be very convenient. If you are looking for a quality acoustic-electric guitar under $1000, you won't be disappointed with the Ovation Standard Elite 2778-AX. .Sound is subjective, but I absolutely love the acoustics of this instrument with its contour body and AA solid top spruce soundboard. everytime I hear it, it makes me smile. my best purchase in years. high quality electronics, onboard tuner, removable shims make adjusting the action very easy. .This guitar has been nothing but a headache since I got it. Came with the strings sitting about a mile off the fret board, frets were sharp and unlevel causing all kinds of buzz. After spending more money getting someone to fix what the factory should have done with the frets I find that the truss rod rattles when you strike the D string while fretting the low E on the 7th fret. Only way to stop the buzz is tighten the truss rod but then the strings buzz because the neck is too flat. For the amount of money I spent on this guitar I would have expected better quality than this. Stay away from this guitar it is junk. .Only thing I don't like is the plastic back, but hey that makes it cheaper so more of your money is spent on the more important parts. My dad gave this guitar to me after owning it for about 20 years, and I have to say I thought it was worth alot more when I first played it, it has a beautiful sound and look even after this long, and I expect it to last a long while longer. Great guitar.Can't say much about how it is right out of the box though, I wasn't even born yet. Sounds great Unplugged or not. Like I said I thought it was worth a lot more.